Roster update for NBA 2K14 PC that includes all the new trades (accurate as of July 13, 2014). The update includes the most recent trades that have happened this off-season in the NBA, but it does NOT include the rookies. No Charlotte Hornets. All players are activated (no injuries). 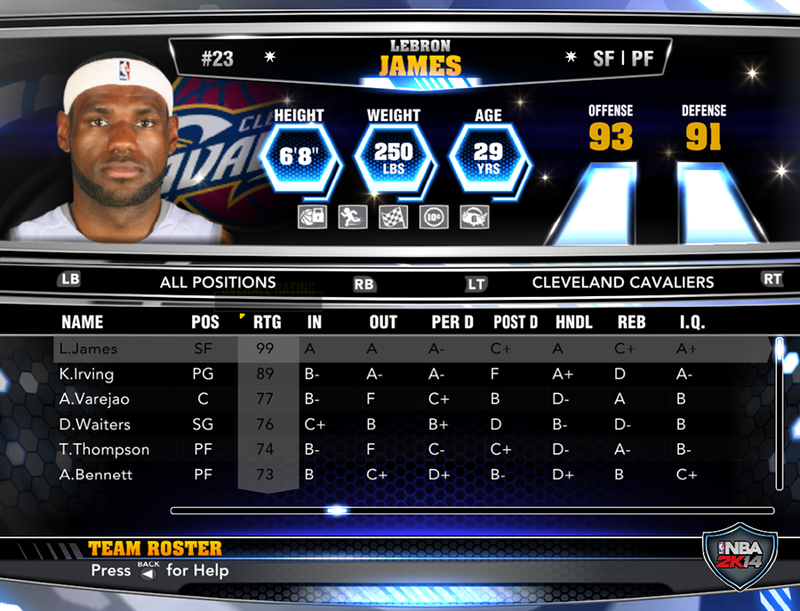 Roster is based on the final roster update from 2K Sports. It should work on all game modes. Feel free to edit and update as I don't have the time to keep up with the latest transactions. Installation: Extract the roster file into your Saves folder. You can access the NBA 2K14 Saves folder by typing %AppData% in Windows Start Menu search box or RUN dialog box (Windows key + R), press Enter then open 2K Sports > NBA 2K14 > Saves. Folder path: C:\Users\<User>\AppData\Roaming\2K Sports\NBA 2K14\Saves. To use, go to options > load/save > load > select the roster file.